You won't be able to use a sword in Fable: The Journey. Or a gun. You may have been able to surmise this from the game's E3 demo or from Brian Crecente's impressions a couple months back. 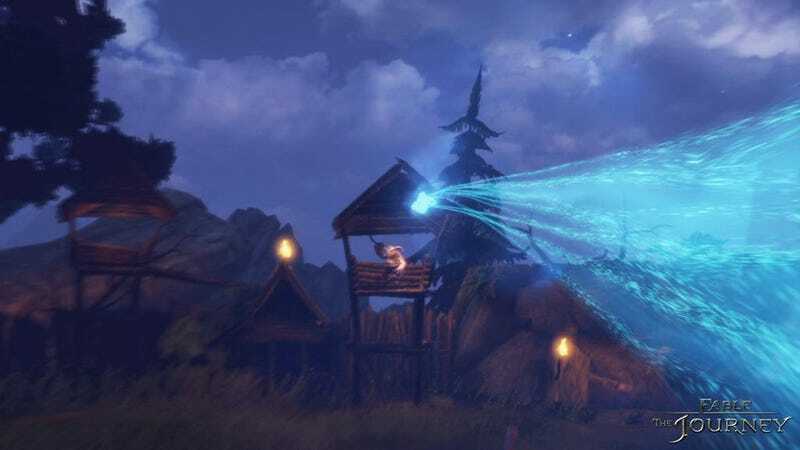 Molyneux Disowns Fable E3 Demonstration as a "Horrendous Mistake"
But, speaking to OXM, Peter Molyneux wants to make sure you know the reason behind the design decision. We could have done melee weapons, but the one thing I hate about melee weapons, and guns as well, is that the human brain is encoded to expect recoil from those things," Molyneux explained. The alternative, then, is magic, for which we have none of said encoded expectations. I suppose that's okay. I don't think I'll miss swords or guns all that much when I'm wielding thunderbolts between my bare hands.